Today Prof. Krishnamurthy (Dept. of Agricultural Extension UASB) took me to the Bio Resource Complex (part of the Department of Biotechnology, Ministry of Science and Technology, Govt. of India, New Delhi), just some 40 km. out of Bangalore. On our way we made a stop at a well know (actually: quite famous) farm, which is more or less the result of an ‘Integrated Farm Management Project’ of the University of Bangalore. That this project was rather successful, is shown by the many picture within the farmhouse. The farmer was 4 times (and 3 years in a row) awarded as the ‘best farmer’ (also as the ‘best organic famer’), both on State and National level, and even one picture shows the PM of India visiting his farm. Indeed the farm is impressive. It is only 2 acres, but because of a very sophisticated system of crop rotation and an optimal synergy between the different elements, the farm offers the possibility to be very sustainable, both economically and in an agronomical way. Indeed, the farm is a classic example of an ‘integrated farm’, with an absolute minimum of external inputs and fully organic. In spite of the small scale (just 2 acres), the farm produces all kind of products: milk, eggs, chickens, flowers, fish, vegetables, herbs, medical plants, spices, peppers, tomatoes, coconuts; name it, it’s grown on the farm. Even worms are part of the integrated system. Manure and organic waste is transferred into compost, and biogas is used for cooking. The engine of an old scooter is used for empowering the pump for sprinkler and drip irrigation. And so on. 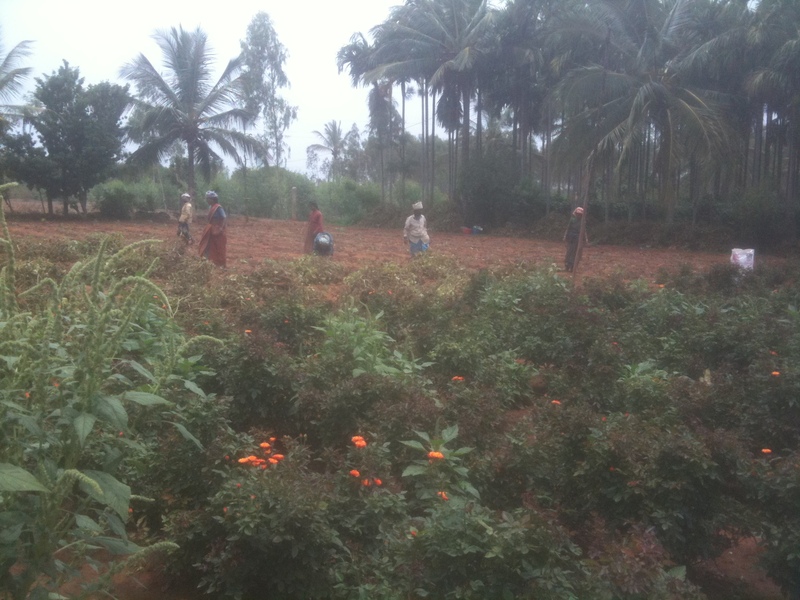 The farm is not just a pilot and therefore just an isolated island within rural Karnataka. When this prototype of farm was developed, also the economic and institutional context has been analyzed and taken into account. Market relations, food chains, certification of products, quality measurements, labor supply, contract farming; everything was developed in a truly ‘integrated way’. In combination with the very fertile soil and optimal weather conditions (the farm produces the year round, and some crops are grown and harvested three or even four times in a row within one year), this small (2 acre) family farm indeed might be a promising solution for the future of rural India. Just some miles away from the farm, the Bio Resource Complex is located. It is one of the almost 700 agricultural research, training and extension centers that tries to link scientific knowledge to local knowledge and tries to adapt technologies to local conditions and the diversity of rural practices. It is a classical example of what in the old days in Holland was called the ‘OVO drieluik’: the combination of Research, Extension and Education (“Onderzoek, Voorlichting, Onderwijs”; OVO). This ‘OVO drieluik’ takes an important place in between science on the one hand and the agricultural practice on the other. But in India it doesn’t operate in the same old fashioned way as it was organized long time ago in The Netherlands; it is reshaped in a more modern and sophisticated way. In part three I will go more into detail about this network of institutes that promotes the modernization of rural India in a new and very promising way. This entry was posted in Agriculture, Education, Rural Development and tagged Agriculture, Bangalore, Education, IMRD, Rural Development by Jan Schakel. Bookmark the permalink.